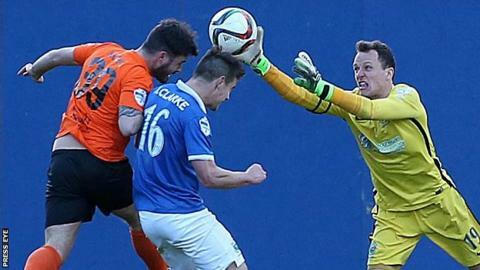 Carrick Rangers will entertain Linfield in the semi-finals of the County Antrim Shield, with Championship side Larne hosting Ballymena United at Inver Park. Both ties will be played on Tuesday 1 December, with 19:45 GMT kick-offs. The Blues earned a testing trip to Taylor's Avenue by beating Cliftonville 3-1 after extra-time at Windsor Park. Larne defeated Ards 2-1 in their quarter-final, Ballymena won 2-0 away at Crusaders and Carrick edged out H&W Welders 3-2 to make the last four.